Is Eating Tilapia Nutritious or Harmful to Health? Davao 1 August 2009.Tilapia, one of the country’s most popular fish, has been around since Biblical times. In fact, it is sometimes called “Saint Peter’s fish” because that was the fish that the apostle caught which reportedly carried a coin in its mouth. In the past, tilapia was only raised in Africa, but accidental and deliberate introductions of the fish into freshwater lakes made them feasible to be raised in tropical climate such as Indonesia, Philippines, Thailand, and Malaysia. Worse than bacon? Tilapia offers health benefits if farmed and prepared right. After carps and salmonids, tilapia is now the third most important fish inthe world. Touted to be the single most important aquaculture product, tilapia has been called as the “food fish of the 21st century” by Dr. Kevin Fitzsimmons, president of the World Aquaculture Society. Asia is the main region where tilapia is now produced as it accounts for 63% of total tilapia production. China, Indonesia, Thailand, and the Philippines, are the region’s top producer of the fish. Last year, the Philippines contributed 250,000 metric tons, according to Dr. Rafael D. Guerrero, the director of the Laguna-based Philippine Council for Aquatic and Marine Research and Development (PCAMRD). Dr. Guerrero is the man who popularized tilapia as the second most important fish among Filipinos – after bangus. “Historically, the introduction of the first tilapia species, the Mozambique tilapia, in the Philippines in 1950 was initially not well-accepted by the industry because of the lack of appropriate culture techniques,” he said. However, the coming of the Nile tilapia in the 1970s improved the acceptance of tilapia in the country because of its lighter color and faster growth rate compared to the Mozambique tilapia. It earned the moniker “aquatic chicken” because it has good attributes that make it suitable for aquaculture. “It matures early, breeds readily and is a hardy fish,” Dr. Guerrero said. 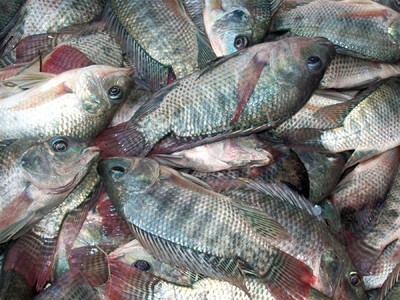 Most of the tilapia raised in the Philippines are consumed locally. Both Americans and Europeans are also fond of tilapia since they consider it as “white meat,” a health food low in cholesterol and fat. Also, chefs have a preference for tilapia’s firm meat. But there may be some bad news. In the United States, a study done by the Wake Forest University School of Medicine shows that eating tilapia is not good for those with heart problems. “Cardiologists are telling their patients to go home and eat fish, and if the patients are poor, they’re eating tilapia. And that could translate into a dangerous situation,” said the researchers from the The university study showed that farm-raised tilapia, one of the most highly consumed fish in America, has very low levels of beneficial Omega-3 fatty acid and, perhaps worse, very high levels of Omega-6 fatty acids, researchers claimed. They said the combination could be a potentially dangerous food source for some patients with heart disease, arthritis, asthma and other allergic and auto-immune diseases that are particularly vulnerable to an “exaggerated inflammatory response.” Inflammation is known to cause damage to blood vessels, the heart, lung and joint tissues, skin, and the digestive tract. In an article which appeared in the Journal of the American Dietetic Association, the researchers claimed that tilapia has higher levels of potentially detrimental long-chain Omega-6 fatty acids than 80-percent-lean hamburger, doughnuts and even pork bacon. Eating tilapia is worse than bacon? That was Dr. Floyd Chilton, a professor of physiology and pharmacology and the director of the Wake Forest Center for Botanical Lipids, told the American media. Howver, let’s take a closer look at the comparison. Tilapia has 26 grams of protein while bacon has a measly 0.07 gram. Tilapia’s fat content is three grams compared to 100.76 grams for bacon. In addition, tilapia is an excellent source of phosphorus, niacin, selenium, vitamin B12, and a good source of potassium. Bacon, on the other hand, contains 1,000 milligrams of sodium, 166 milligrams of cholesterol, and enough possible carcinogenic nitrites to make pregnant women think twice. Instead of frying tilapia, she recommended that you grill, boil or steam the tilapia. “This will help you cut down on total fat in the diet.” But if you want to fry or sauté it, use canola or olive oil. Or cook in coconut milk (as in ginataang tilapia). Unlike other fish, tilapia has very low levels of mercury because it is fast growing- and short-lived fish that has a vegetarian diet.